Citations support the communication of specialist knowledge by allowing authors and readers to make specific selections in several contexts at the same time. In the interactions between the social network of (first-order) authors and the network of their reflexive (that is, second-order) communications, a sub-textual code of communication with a distributed character has emerged. The recursive operation of this dual-layered network induces the perception of a cognitive dimension in scientific communication. Citation analysis reflects on citation practices. Reference lists are aggregated in scientometric analysis using one (or sometimes two) of the available contexts to reduce the complexity: geometrical representations (‘mappings’) of dynamic operations are reflected in corresponding theories of citation. For example, a sociological interpretation of citations can be distinguished from an information-theoretical one. The specific contexts represented in the modern citation can be deconstructed from the perspective of the cultural evolution of scientific communication. Citation analysis has been a formative instrument of scientometrics as a subject of study for several decades. The primary impulse to organize citations into a Science Citation Index came, however, from information retrieval. Eugene Garfield (1979, at p.7) was inspired by the American system of legal documentation. In an early phase, Derek de Solla Price joined the citation project: he associated the data of the SCI with measurement techniques. Concepts like ‘mapping science’ by studying the dynamics of citation networks were introduced (e.g., Price 1965; cf. Wouters 1998). Notwithstanding serious attempts in this direction (e.g., Small 1978), a complete theory of citation is still lacking. In 1981, two authors raised this problem independently, yet from different perspectives: Cozzens (1981) provided a review of citation theories from the perspective of sociology, and Cronin (1981) asked for a theory of citation from the perspective of information retrieval. In his ensuing monograph, Cronin (1984) discussed citation as a function in scientific communication among texts. In citation context analysis (e.g., Chubin and Moitra 1975; Moravcsik and Murugesan 1975), the theory of citation had until then been developed mainly with reference to the uses of citations within articles. Others (e.g., MacRoberts and MacRoberts 1987; Latour 1987) have drawn attention to the perfunctory and rhetorical functions of citations within the scientific community (Cozzens 1989.) Evaluation studies for science policy purposes have considered citations as an indicator of reward in the science system (Martin and Irvine 1983; Moed et al. 1985; Luukkonen 1990; cf. Merton 1968; Latour and Woolgar 1979). Furthermore, new scientometric indicators such as ‘co-words’ were introduced in the 1980s (Callon et al. 1982). While ‘co-citation maps’ were interpreted as representations of perceptions by citing authors (Small 1973; Small and Griffith 1974; cf. Small 1978), co-word analysis provided us with representations of semiotic networks among these authors (cf. Callon et al. 1986). In summary, a variety of theoretical contexts for citation analysis was proposed, but a comprehensive theory of citation itself could not be formulated. The variety of indicators made scientometricians aware that citations are specific, yet they share some properties with other textual indicators. Citations refer to another word, phrase, sentence, paragraph, or title of text from the perspective of the citing article. While in the case of co-word and co-citation analysis the relation is constructed by the analyst, the citation is provided as a link between two documents by the citing author him/herself. Citation is in this sense not a scientometric indicator; scientometric analysis is based on a careful reconstruction of citation practices using, for example, the Science Citation Index as a database (Kaplan 1965; cf. Wouters 1997). In practice, however, the meaning of citations seems easier to understand intuitively than that of analytically defined codes in scientific texts (Snyder et al. 1995). Furthermore, citations are an order of magnitude more specific than, for example, shared (co-)words (Leydesdorff 1989). Citations thus seem to have specific functions in the research process (Garfield 1996). In this study, I argue that citations as currently understood emerged during a certain phase of the scientific development in physics, namely in the early 20th century. The historical deconstruction of the citation in terms of interacting networks of authors and texts will enable me to suggest a new theory of citation as a dynamic operation that allows for reduction of complexity in various contexts at the same time. The dynamic perspective of selections operating upon selections in other networks accounts for the character of citations as statistical (i.e., uncertain) indicators, for their specificity, and for their multi-contextuality. A reappraisal of existing theories of citation becomes possible, and thus an opening to the discussion among citation analysts can be suggested. Citation analysis itself considers the use of citations in scientific literature as a practice, and the articulation of a theory of citations has remained firmly on the agenda of scientometrics. While scientometric indicators can be defined as formal methodologies, the citation process is social, and therefore challenges the substantive understanding: under which conditions can citation be used as a measure of impact, quality, relevance, reputation, etc.? How do insights from various disciplines contribute to our understanding of the epistemological process and the working mechanism of citation in science? Why has citation as a social act held such a prominent position in the generation of knowledge? Or is this very statement a distortion with hindsight from a citation analyst’s perspective (Edge 1979)? Let me introduce some analytical distinctions. The quest for a theory of citations presumes that citations themselves should be explained. First, however, one may wish to raise the question of whether citations belong to the explanandum-that is, the subject to be explained-or to the explanans-that is, used to explain something else. If citation analysis is primarily a tool for explaining, for example, the growth of science, can then a ‘theory of citation’ be nothing more than a methodological reflection designed to improve the accuracy of this measurement? In my opinion, citation analysis is regularly used as a tool or an indicator within an explanans. A lack of theoretical clarity about what is to be explained by using citation analysis is almost unavoidable if the focus is-as often happens in scientometric studies-on improving the tool without theoretical attention to the specification of the explanandum. A problem formulated in a policy context does not always need to be elaborated theoretically. A narrative interpretation of the mappings may suffice (cf. Glänzel et al. 1996). Differences between mappings can be studied fruitfully as validation problems (Leydesdorff 1987; 1989; 1992; cf. Van Raan 1988). But when one raises questions like whether citations indicate ‘quality’, ‘impact,’ ‘status,’ etc., one is in need of a clear definition of these concepts with reference to units of analysis. Is it the quality of an author or an institution, or the quality of articles themselves that is implied? Is one type of mapping more suitable than another for exhibiting one or another type of quality? The functions of citations are expected to be different when different contexts or different levels of aggregation are studied (Leydesdorff and Amsterdamska 1990). Let us first focus on ‘citation’ as something to be explained (explanandum) because this specification is an initial step toward the articulation of a theory of citation in the proper sense. What actually are citations? As noted, citations are references to another textual element, from the perspective of the citing article. In order to have citations, there must be a cited-citing pair. From a formal perspective, cited-citing pairs are relations. By adding a dynamic perspective, these relations can be considered as relational operations. The relational operation is recursive: for example, citations may refer to other texts in which citations refer to still other texts. Thus, a network of citation relations is spanned at each moment in time and reproduced over time. The network, resulting from this repeated operation is expected to have an architecture. Therefore, citations have a position in a multi-dimensional space constituted by other citations. Two operations can be close in terms of position without having a relation or without sharing a common relation (Burt 1982). An operational relation is able to function in a network because of its position. Operations are expected to be reproduced if they carry functions. Thus, one has to specify the functionality of the citation process. The functionality is understood to be embedded in the distribution (Maturana and Varela 1980). While citations can be observed as specific events, they acquire analytical meaning only in terms of distributions: why was this citation used and not another? Actually, citations occur usually in groups, that is, as lists of references. Citation analysis studies the traces of the operation of this distributed network system. Citations are then observed at the nodes of the network (that is, within texts), whereas the recursive operations at the network level remain hypotheses about their cognitive functions. One is able to reconstruct only analytically this cognitive structure, for example, in terms of an ‘eigenstructure’ of the dual-layered network. From this perspective, the observables test the theoretically informed expectations about the network’s structure, and thus, cognitive assumptions are changed or reinforced. The operation is additionally dynamic: the distributions exhibit the patterns and structures of expectations for further operation. Thus, the process of new knowledge claims is propelled and made more precise and selective. The dynamic aspect is of the utmost importance: even when the links of a network are stabilized-as in the case of telephone lines-the frequency of the operation over the lines can still be distinguished analytically from the observable carriers. The function of citations in propelling the networks of substantive knowledge contents is different from, yet constrained by their propagation through networks of textual and social relations. I wish to argue that this multi-dimensional network is dually layered: citations are the result of the interaction between networks of authors and between networks of their communications. Thus, the modern citation is constitutionally complex, and therefore it can function in scientific practices by indicating both the cognitive and the social contexts of a knowledge claim. At a generalized level, citations, as potentially repeated operations, sustain communication in the sciences by drawing upon cognitive and social contexts. The scientific publication which makes the citation can then be considered as an event: each publication potentially redistributes citation patterns, although the change in the overall distributions may be marginal. Thus, the subtext of a communication pattern can be communicated in a complex way among networks of authors and texts. Citations, however, are neither a necessary nor a sufficient condition for scientific communication. While nowadays they help to sustain the communication, the process of their codification has varied across fields of science (Price 1970). Citations did not emerge historically with scientific literature at the time of the scientific revolution. They emerged from the specific organization of the sciences in the late 19th century. Of course, authors have always made references. The scholastic tradition of the Middle Ages, for example, can be typified by its tendency to comment on previous generations of authors (especially, Aristotle). The reference implies an implicit citation, but these citations were not to contemporary colleagues with whom one could dispute the interpretation of a text; the reference was rather to the text under discussion. In a religious society of the monotheistic type, every text is essentially a further explanation of the original text, like the Bible or the Koran. Thus, scholastic authors had to legitimate their contributions within their tradition (e.g., Weinberg 1997). In modern sciences, references have a different function. A new knowledge claim adds to the scientific literature by drawing a further distinction (Luhmann 1990, pp. 75 ff.). Some citations serve to indicate where and when a new distinction can be drawn, and may indicate how such a knowledge claim can be reintegrated into a body of theorizing. Because of the recursivity involved, citations exhibit the collective character of scientific achievements at each moment in time. At the time of the scientific revolution, Newton expressed this collective character of the modern scientific enterprise with his well-known aphorism: ‘If I have seen further, it is by standing on the shoulders of giants’ (Merton 1965). These giants were scholars like Galileo, Kepler, and Huygens, with whom Newton sometimes communicated personally or in writing. Circles of correspondence among leading scientists were organized by Mersenne (1588-1648) in Paris and Oldenburg (1615-1677) in London (Kronick 1991). This must have been Signior Rizetti’s mistake . . . for several of the Persons present at my Experiments made the same Mistake at first before they could perform the Experiment in manner above-mentioned. The ‘M.’, which stands for ‘Monsieur’, is still available as a form of communication among authors in French scientific literature. Science in the 18th century was largely based on personal communications. The 19th century witnessed the further institutionalization of science and scientific communication. For example, the Proceedings of the Royal Society began to appear from 1800 onwards. In Prussia’s Humboldt University (after 1815) research joined education as a major function of the university. Thus, the holding of a Chair in an institute became a crucial factor for career opportunities in science. In short, science became an institutionalized social system (Stichweh 1984). By 1800, the codification of the legal system had provided formats for systematic and depersonalized communication: legal and material rights can be distinguished when natural law is formalized into positive law (Weber, 1922, pp. 503 ff. ; Habermas 1981, pp. 351 ff.). Further institutionalization and growth of science during the 19th century made it increasingly possible to communicate also in this context with texts that were indicated by personal names, yet without primary reference to specific individuals. The individual scholar increasingly becomes the carrier of a knowledge claim in a network of communications among scholars. The claim itself can be debated, irrespective of the author, his or her institution, the quality of his or her oeuvre, etc. The lack of concern with dating references, and the age of the references that are dated, further weaken the sense of a coherent, moving research front. In both 1893-95 and 1900-1901 (Bazerman’s sample years, L.), 52 percent of the references are undated, and only about 30 percent are dated six years or less from the article’s publication. After 1910 the number of (dated) references per article increased rapidly, and the modern citation became a specific layer of communication in and among scientific texts. The citation from then onwards can be considered as a concept-symbol (Small 1978) instead of a reference to a person’s oeuvre (cf. Meadows 1974, pp. 83 ff.). In his historical exercise to construct a Physics Citation Index, Small (1986) analyzed the 1920s. This is the period in which citations could for the first time be aggregated because of the further development of the modern format. Note the novelty of the transition: the interaction between a second-order layer of reflexive communications among (first-order) authors provides the condition for the generation of a more abstract cognitive structure of concept-symbols. The dual-layered network system of (1) social relations among scholars and (2) relations among communications is expected to resonate dynamically on the basis of interactions in some directions, while not in others. The structural dimensions of this complex network are partially correlated to individual authors as carriers of the communication, as they are also correlated to the textual dimension of the knowledge content (Leydesdorff 1995). The interactively emerging dimension itself remains latent while it develops, and thus a strategic vector is induced that can be recognized (cf. Abernathy and Clark 1985). The recognition recursively assumes and refines cognition within the observing systems (Maturana and Varela, 1980). Over time, this operation becomes thoroughly selective on both sides: citations are sometimes ‘obliterated by incorporation’ (OBI) into the body of knowledge,25 and social factors may temporarily play a role for further selections, e.g., in terms of reputations. In principle, two selective layers operating upon each other tend to extinguish the signal. However, at some places the two distributions may happen to ‘lock-in’ because a third (that is, cognitive) dimension can be carried further by a specific combination. In this co-evolution between communications and authors, distributions of citations may function, among other things, as contested boundaries between specialties. Since citations are distributed, the boundaries remain to be validated (Fujigaki 1997). Functions are expected to change when the research front moves further. By using references, authors position their knowledge claims within one specialty area or another (Amsterdamska and Leydesdorff 1989). The implied social and cognitive dimensions enable practicing scientists to use citations as an instrument for retrieval. Some selections are chosen for stabilization, for example, when codification into citation classics occurs (Small 1974; cf. Garfield 1979). Some stabilizations are selected for globalization, that is, when ‘tacit’ knowledge is accepted at a super-systemic level (Merton 1965, pp. 218 f.). As the complex network is further shaped, citations allow for richer communications since both social and cognitive factors can be incorporated into the progression of the sciences. A reference to a codified citation provides a shorthand for not having to explain a method or another intellectual tool (Garfield 1979, p. 246). The meaning of this reference has then become stabilized within a specific scholarly community, while intellectual and social boundaries are reinforced by readers familiar with the reference (cf. Whitley 1984). In summary, the historical origins of the epistemological function of citation as a social practice are to be found in this distributed and dual-layered operation. The dual-layeredness of the distribution induces the dynamics, since selections operate on selections. Yet the cognitive principle of referencing, once historically invented, had still to be diffused and then to be institutionalized. This codification of science as a network of reflexive communications on top of a first-order network of social relations among scientists is a historical process that is also reflected in other ways. Not until the late 1960s did philosophers and historians of science like Price (1965) and Kuhn (1962/ 1970) begin to be able to understand science as an order emerging from networks of communication relatively independent of carrying authors (Garvey 1979). 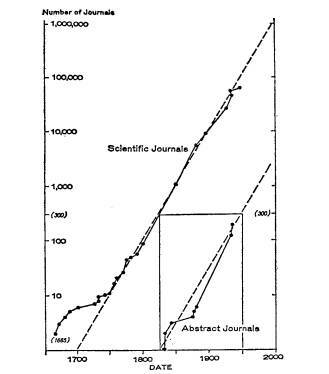 Price (1961), for example, noted the emergence of abstract journals during the 19th century as shown in his well-known graph reproduced in Figure 1. Once the number of scientific journals had exceeded a few hundred, higher-order codification became a condition for the further growth of knowledge. One could no longer rely on selections by individuals; networks of communication based on the interactions between people and journals ease the reproduction of the system by taking over selective functions at an above-individual level. Total number of scientific journals and abstract journals founded, as a function of date. From: Price (1961). Social factors also have played a role in these historical transitions, like the cheaper production of paper when cotton became available to the textile industry on a large scale (Gouldner 1976). Social contexts provide the resources for taking the next steps in the cultural evolution of the sciences (Barnes and Edge 1982; Leydesdorff 1997). The codification of science, its disciplinary differentiation (Stichweh 1990), and its institutionalization in the Humboldt-type universities (Jencks and Riesman 1968) made it necessary to develop new styles of referencing that honour science as a social enterprise and in terms of concept-symbols more abstract than authors’ names. Thus, the modern citation was born as a code and a medium of communication in the early 20th century. It was well into this century before the philosophy of science was able to achieve an understanding of ‘truth’ as an attribute no longer of a (personal) idea, but of a communicative statement. Citation could not be a major focus in this new philosophy of science, because the citation indicated a relation with science as a practice (that is, Popper’s ‘context of discovery’). Only in a context like that of science studies as an interdisciplinary area (e.g., Spiegel-Rösing and Price 1977) can citation analysis be a legitimate subject of study. Citation analysis, thus, reflects another turn of the tables. After World War II, science had grown so expensive and so differentiated in disciplinary organization that new instruments were needed for its managerial control. From within the scientific institute, information retrieval posed a new challenge. At the level of society, Vannevar Bush’s The Endless Frontier (1945) should be mentioned here. In this Report to the President, Bush requested political support for fundamental research, that is, as a separate domain of social organization and state intervention. Indeed, the late 1940s and the 1950s witness what can with hindsight be called ‘the institutional phase of science policy’ (e.g., Spiegel-Rösing 1973). Since the 1950s, funding acknowledgements and institutional addresses regularly appear in scientific publications (Gillmore 1986, p. 115; cf. Rip and Hennekam 1985). In this context of science management and scientific information, citations can be used as proxies (Adair 1955; Garfield 1955). Citation indexing inadvertently changes the system of reference for citation analysis. While citations can be used to trace intellectual influence and to retrieve information by taking the cited text as a lead to follow the history of a knowledge claim (Latour 1987), the construction of an index inverts the time axis (Wouters 1997). In citation analysis, citations are counted from the citing texts, and thus cited texts are provided with authority by hindsight (Garfield 1979). This reflection changes the model from a historical to an evolutionary one: older texts constitute variations which compete for citations in ‘current contents.’ The analytical focus of citation analysis is on selection in the present: the operation is foregrounded. Therefore, stabilization and codification have now to be explained. Note the contrast with citation of the Bible for scholastic reasons. Whereas citation is an emerging (reflexive) practice, citation analysis implies a reflexive theory. While this theory has not (yet) been articulated, the field may seem to be driven by measurement problems. However, the operation is entirely theoretical: citation analysis reconstructs scientific development in an evolutionary mode with reference to scientific developments which are themselves being continuously reconstructed. All the empirical sciences reflexively rewrite their histories in the light of new evidence. The implied evolutionary understanding of science is reinforced by citation analysis. This implication is also part of the reflexive rewriting of the history of scientometrics as a field of science. What have citations meant for our specialty? While citations are used by historians to track developments of the sciences, citation analysts reconstruct history from a perspective in the present. A theory of citation becomes urgent when this perspective is understood as a cultural construct itself (Mulkay et al. 1983). Because it is possible to change perspectives, a scientific text no longer has an inherent and a priori value. Each knowledge claim can be provided with a revised function during the further evolution of the distributions. Different functions can be equally valid or valid at different moments in time. A distribution of functions can be distinguished, and so the functions become uncertain and reflexive expectations. The same authors can be cited because of different knowledge claims. The unit of analysis for citation analysis is the scientific paper, unless specified otherwise (e.g., White and Griffith 1981). From an evolutionary perspective, the author can be considered as the retention mechanism of the credit that is attributed to a text by a citation. When credit has accumulated (Latour and Woolgar 1979), the result may be incorporation into codified knowledge by obliteration (Cozzens 1985), or even by ‘eponymy’-that is, attaching a name to a phenomenon like the ‘Zeeman-effect’ (Merton 1957). The retention mechanism feeds back on the citation cycles as one of its reflexive subdynamics. In a social system, the retention mechanism for social accomplishments is usually the institution. However, the institution can be considered as yet another distribution of actors. By taking this uncertainty as unit of analysis, emerging discourse of science & technology policies has been able to intrude into the circle of reflections on scientific discourses (Woolgar 1991). In citation analysis, this potential opening has been recognized by paying increasing attention to institutional addresses. Much effort in the 1980s, indeed, has gone into ‘cleaning up’ the Corporate Index of the Science Citation Index because, from a science policy perspective, individuals are less interesting units than institutions. Nowadays, the CD-ROM version of the Science Citation Index enables the analyst to search the institutional addresses for precise postal codes. The specifications at the micro-level refer to (aggregated) systems that generate specific hierarchies and dynamics by operating in a distributed mode, that is, in terms of micro-events. The various (sub‑)systems participate in each citation to a greater or lesser extent by interacting. Rewards, for example, tend to help stratify the system into social hierarchies, journals help to structure the communication, while cognitive resources are aggregated in terms of more abstract categories like theories. Each event is a micro-operation, but the distributions of these interactions can be organized along different axes. This can be reflected using corresponding theories. The relation between the micro- and macro-level of analysis introduces the dynamics of reproduction into each dimension as yet another research question. One expects networks to be reproduced in a distributed mode but at specific locations (Maturana and Varela 1980; Rumelhardt et al. 1986). In this manner, a network with a structure is generated. This dynamic problem has been discussed by sociologists in terms of action/structure contingency relations (Giddens 1984; Luhmann 1990; cf. Leydesdorff 1993). While theories about these complex static relations tend to be formulated in terms of geometries (that is, in terms of multi-dimensional spaces and mappings), the dynamic analysis requires an algorithmic approach (Gilbert 1997). In summary: the mechanisms of aggregation can be specified in each dimension of citation analysis with reference to potentially different dynamics. While a dogma of micro-foundation on action has prevailed in economic and sociological analysis, aggregation in science is expected to contain both ‘within group’ and ‘in-between group’ variations (Leydesdorff 1995). Thus, a complex dynamics is potentially generated along each axis. Action (that is, citation) is therefore a complex phenomenon. Furthermore, what is being aggregated can vary among research traditions. Accordingly, the interactive and the aggregative components of the phenomenological variations will be appreciated differently. While citations were most fruitful for practicing scientists-allowing them to link social and textual information-the irreflexive usage of this measurement unit in citation analysis has generated resistance among active scientists. Citation analysis calls for a theory of what is being analyzed; citation analysts consequently tend to be in need of theoretical legitimation (Luukkonen 1997). Can such a theory of citation be provided by Science and Technology Studies? What have citations and citation analysis meant for the empirical study of the sciences during the relatively short history of STS? As early as 1978, Yehuda Elkana, Joshua Lederberg, Robert K. Merton, Arnold Thackray, and Harriet Zuckerman co-authored a first systematic reflection in what they called Towards a Metric of Science: The Advent of Science Indicators, while earlier contributions had been programmatic to the enterprise of developing ‘scientometrics’ as a field of study (e.g., Price 1965a and 1965b). The 1970s witnessed the gradual emergence of the industrial practice of citation analysis (Narin 1976; Garfield 1979). Furthermore, Tibor Braun founded the journal Scientometrics in 1978 (cf. Wouters and Leydesdorff 1995), and soon thereafter the first academic units for citation analysis were established (ISSRU, Budapest, 1983; CWTS, Leiden, 1984). In terms of disciplinary affiliations, the response to the advent of citation analysis has been more enthusiastic among philosophers and historians of science (e.g., White et al., 1979) than among sociologists (e.g., Edge 1979). The ‘new sociology of scientific knowledge’ wished to focus on practices (e.g., Gilbert 1977; Gilbert and Mulkay 1984), and most of these scholars tended to avoid formalized measurement (Chubin and Restivo 1983). During the 1980s, the systematic application of scientometric indicators to policy issues, however, triggered a practice of improving on the measurements (Martin and Irvine 1983; Moed et al. 1985). As noted, other indicators like co-words were developed (Callon et al. 1982; cf. Van Raan 1988), and citation analysis was increasingly used in empirical STS research (e.g., Nadel 1983; Cozzens 1985). In 1987, I organized a workshop, followed by a theme issue of Scientometrics in 1989, in an attempt to bridge the gap between qualitative research in STS and scientometric methods (Leydesdorff et al. 1989). It remained a brief encounter: ever since, the subfields of STS have increasingly specialized, as can be seen by using aggregated journal-journal citation analysis reflexively (Leydesdorff and Van den Besselaar 1997). On the qualitative side, scientometrics tends to be type-cast as a rhetorical practice (e.g., Woolgar 1991; cf. Gilbert 1977). On the quantitative side, theoretical research has developed with reference to scientometric practices (e.g., MacRoberts and MacRoberts 1987; Luukkonen 1990; Callon et al. 1993; Leydesdorff 1995). Nowadays, three main traditions can be distinguished in STS: (a) socio-historical analysis mainly using historical case study research for specifications, (b) quantitative studies oriented towards formalization and generalization, and (c) policy and management studies that utilize results from (a) and (b) pragmatically.53 Citation analysis is relevant in these three traditions, but for very different reasons (Cozzens 1989; Luukkonen 1990). Citation analysis has been of particular interest to science studies as an interdisciplinary field because it has allowed analysts to move back and forth between the cognitive, the textual, and the social dimensions of science in terms of socio-cognitive interactions. For example, the number of times an article was cited could be taken as an indicator of the impact of the cited author(s), and thus a translation could be made from the cognitive use of citations in a text to the social system of rewards operating in the scientific community. In the science policy arena, furthermore, the citation argument has helped to make scientists more aware of the social and communicative contexts of their arguments, and thus to legitimate the sociological analysis of the sciences. Both within STS and in neighbouring disciplines, this placing of the sciences into contexts without further theoretical and methodological reflection has been criticized. One is not allowed to infer from the impact of an article, measurable in terms of numbers of citations, the quality or lack of quality of a particular researcher or research group (Collins 1985). The use of archival records to measure social structural properties has been criticized from the side of social network analysis (e.g., Burt 1983). Mulkay et al. (1983) have noted the methodological bias in inferring the other way around from citations to cognitive impact. Discursive, social, and cognitive functions are neither symmetrical nor synchronous. Furthermore, citation analysis can be abused for political purposes if not sufficiently based in reflected norms of ‘best practice’ (cf. Glänzel 1996). STS has split into various research traditions which tend to be highly critical of each other’s assumptions and ‘best practices’. Yet citation, with its specifiable relevance in all these dimensions, remains an attractive candidate for studying the differences. Is one able to specify a hierarchy among the potentially different functions of citations? Of course, a hierarchy can be constructed from each of the competing perspectives. But do criteria exist in this post-modern world to justify the choice of one selection over another? In this study, I have focused on the generation of citations as carriers of cognitive information. For this purpose, the cognitive dimension was considered as an overlay that was first achieved historically and then codified on the basis of interactions among scientists and their communications. It is both social and cognitive, both a network of actors and a network of networks. Yet it is highly selective, since the networks operate in terms of selections. Scientific cognitions can be analyzed as the unintended (that is, latent) eigenvalues and eigenfrequencies of the networks of these complex interactions. Cognitions thus conceptualized remain uncertain, subject to discussion, and in continuous flux. Among other things, the operation of two layers upon each other in a distributed mode enables this system to develop ‘operational closure’ as in the case of paradigm formation (cf. Luhmann 1990; Leydesdorff 1995). During the generational phase, the cognitive dimension can be considered as a dependent variable. In evolutionary developments, however, the emerging dimension is able to take over control by selecting increasingly upon the underlying ones. In the mature phase, the different dimensions select upon each other, and the locus of control may shift unexpectedly in terms of the densities of the selections. These alterations in frequencies induce life-cycles: what had to be referenced at one moment is taken for granted at the next moment, or perhaps codified as in the case of eponymy. In a complex dynamics, selection and variation are sub-dynamics that can only be identified by taking a theoretical position or, in other words, by specifying a window of observation. Each window of observation allows for another assessment of the data under study. Once this has been accepted among the analysts, it becomes important to specify which window one takes, so that the partial insights thus obtained can be made reflexively clear in terms of their relevance. In this post-modern regime, the quest for a single theory of citation has to give way to the debate among citation analysts who have become aware of the relativity of their positions. By being reflexive about their positions, these authors may be able to contribute to each others’ self-understanding and thereby reinforce quality control among themselves. Whether the resulting interactions can be codified in a meta-theory remains uncertain. I have argued that the quest for a grand theory of citation implies a meta-theoretical question, since citation analysis is itself based on a theoretical reflection of scientific practices that have been shaped historically. The historical, philosophical, and/or sociological positions taken by citation analysts, however, have usually remained implicit. Although theoretical notions from these disciplines have guided the research program of scientometrics as heuristics, the analytical unravelling of citation as a complex unity into different meanings might endanger the legitimation of citation analysis practices (Luukkonen 1997.) Theoretical discussions could easily have torn the field of scientometrics apart-as has happened with STS in general-despite this specialty’s firm unity based on its technological interest in exploring the potentials of the relevant databases (Wouters and Leydesdorff 1994). Our recent understanding of social processes as the selective operation of distributions upon underlying distributions provides us with ground for elaborating scientometrics in an algorithmic mode. The various mapping techniques can then be appreciated as providing geometrical representations. Contributions from the qualitative side are selected as far as they allow us to specify equations and routines that can be made relevant to the understanding of the sciences in terms of the massive data that are becoming increasingly available. This ‘translation’ of qualitative insights into formalisms is well-known, for example, in econometrics. As Langton (1989) expressed it: theories specify ‘genotypes’, while the model simulates the ‘phenotype’ because one is able to identify the interaction terms. Such an approach, however, requires a thorough reflection on the literature: when are qualitative scholars analyzing ‘variation and selection’ at each moment in time, and when is the discussion focussed on ‘change and stabilization’ over time? These are different sub-dynamics of the complex system, since only some (instantaneous) selections can be selected for stabilization (over time). How analytically distinct are the models, and how are they confused by taking, for example, too many contextual factors on board? When have qualitative insights been generalized? Secondly, have attempts been made to test using independent datasets? Citations seem an appropriate subject for discussing these issues in both qualitative and quantitative terms: the Science Citation Index, for example, has provided a testing ground for theories in many different directions. Other databases are increasingly available on CD-ROM and the Internet. However, the process of theoretical articulation must be highly reflexive if the scientometrician wishes to understand and profit from the qualitative side of STS. * I wish to thank Tibor Braun, Eugene Garfield, and Robert K. Merton for valuable suggestions in response to previous drafts. 1. Abernathy, William J. and Kim B. Clark, Innovation: Mapping the winds of creative destruction, Research Policy 14 (1985) 3-22. 2. Adair, W. C., Citation Indexes for Scientific Literature?, American Documentation 6 (1955) 31-2. 3. Amsterdamska, Olga and Loet Leydesdorff. Citations: Indicators of Significance, Scientometrics 15 (1989) 449-71. 4. Barnes, Barry and David Edge, Science in Context. MIT Press, Cambridge, MA, 1982. 5. Bazerman, Charles, Shaping Written Knowledge: The Genre and Activity of the Experimental Article in Science. University of Wisconsin Press, Madison, WI, 1988. 6. Burt, Ronald S., Toward a Structural Theory of Action. Academic Press, New York, etc., 1982. 7. Burt, Ronald S., Network Data from Archival Records. In: R. S. Burt and M. J. Minor (Eds.). Applied Network Analysis. Sage, Beverly Hills, etc., 1983, pp. 158-74. 8. Bush, Vannevar (1945). The Endless Frontier: A Report to the President. Reprinted: Arno Press, New York, 1980. 9. Callon, Michel, Jean-Pierre Courtial, William A. Turner, and Serge Bauin, From Translation to Problematic Networks: An Introduction to Co-Word Analysis, Social Science Information 22 (1983) 191-235. 10. Callon, Michel, John Law, and Arie Rip (Eds. ), Mapping the Dynamics of Science and Technology. Macmillan, London, 1986. 11. Callon, Michel, Jean-Pierre Courtial, and Hervé Penan, La Scientométrie. Presses Universitaires de France, Paris, 1993. 12. Cambridge Modern History. Cambridge, UK: Cambridge University Press, 1958. 13. Chubin, D. E., and S. Moitra, Content Analysis of References: Adjunct of Alternative to Citation Counting. Social Studies of Science 5 (1975) 423-41. 14. Chubin, Daryl and Sal Restivo, The ‘Mooting’ of Science Studies: Research Programmes and Science Policy. In: Karin D. Knorr-Cetina and Michael J. Mulkay (Eds. ), Science Observed: Perspectives on the Social Studies of Science. Sage, London, 1983, pp. 53-83. 15. Collins, Harry M., The Possibilities of Science Policy, Social Studies of Science 15 (1985) 554‑8. 16. Cozzens, Susan E., Taking the measure of science: A review of citation theories, Newsletter of the International Society for the Sociology of Knowledge 8 (1981) 16. 17. Cozzens, Susan E., Comparing Between the Sciences: Citation Context Analysis of Papers from Neuropharmacology and the Sociology of Science, Social Studies of Science 15 (1985) 127-53. 18. Cozzens, Susan E., What do citations count? The rhetorical-first model, Scientometrics 15 (1989) 437-47. 19. Cronin, Blaise, The need for a theory of citation, Journal of Documentation 37 (1981) 16-24. 20. Cronin, Blaise, The Citation Process: the role and significance of citations in scientific communication. Taylor Graham, London, 1984. 21. Edge, David, Quantitative Measures of Communication in Science: A critical overview, History of Science 17 (1979) 102-34. 22. Elkana, Yehuda, Joshua Lederberg, Robert K. Merton, Arnold Thackray, and Harriet Zuckerman, Toward a Metric of Science: The Advent of Science Indicators. John Wiley, New York, etc., 1978. 23. Fujigaki, Yuko, Filling the Gap Between Discussions on Science and Scientists’ Everyday Activities: Applying the Autopoiesis System Theory to Scientific Knowledge, Social Science Information (1997; forthcoming). 24. Garfield, Eugene, Citation Indexes for Science, Science 122 (1955) 108-111. 25. Garfield, Eugene, The Obliteration Phenomenon, Current Contents No. 51/52 (1975) 5-7. 26. Garfield, Eugene, Citation Indexing: Its Theory and Application in Science, Technology, and Humanities. John Wiley, New York, 1979. 27. Garfield, Eugene, When to Cite?, Library Quarterly 66 (1996, nr. 4), 449-58. 28. Garvey, W. D. Communication: The Essence of Science. Pergamon Press, Oxford, 1979. 29. Giddens, Anthony, The Constitution of Society. Polity Press, Cambridge, 1984. 30. Gilbert, G. Nigel, Referencing as Persuasion, Social Studies of Science 7 (1977) 113-22. 32. Gilbert, G. Nigel and Michael J. Mulkay, Opening Pandora’s Box: A Sociological Analysis of Scientists’ Discourse. Cambridge University Press, Cambridge, 1984. 33. Gillmor, C. Stewart, Federal Funding and Knowledge Growth in Ionospheric Physics, 1945-81, Social Studies of Science 16 (1986) 105-33. 34. Glänzel, Wolfgang (Ed. ), Proceedings of the Workshop in ‘Bibliometric Standards’, Scientometrics 35 (1996) 165-277. 35. Gouldner, Alvin, The dialectic of ideology and technology. Macmillan, London, etc., 1976. 36. Habermas, Jürgen. Theorie des kommunikativen Handeln. Suhrkamp, Frankfurt a.M., 1981. 37. Jencks, C. and D. Riesman, The Academic Revolution. Doubleday, Garden City NY, 1968. 38. Kaplan, Norman, The Norms of Citation Behaviour: Prolegomena to the footnote, American Documentation 16 (1965) 179-84. 39. Kronick, David, Scientific and technical periodicals of the seventeenth and eighteenth centuries: a guide. Scarecrow Press, Metuchen, N.J., 1991. 40. Kuhn, Thomas S., The Structure of Scientific Revolutions. University of Chicago Press, Chicago, 1962/ 1970. 41. Langton, Christopher G. (Ed. ), Artificial Life. Addison Wesley, Redwood City, CA, 1989. 42. Latour, Bruno, Science in Action. Open University, Milton Keynes, 1987. 43. Latour, Bruno and Steve Woolgar Laboratory Life. Sage, Beverly Hills, etc., 1979. 44. Leydesdorff, Loet, Various Methods for the Mapping of Science, Scientometrics 11 (1987) 291- 320. 45. Leydesdorff, Loet, Words and Co-Words as Indicators of Intellectual Organization, Research Policy 18 (1989) 209-223. 46. Leydesdorff, Loet, A Validation Study of ‘LEXIMAPPE’, Scientometrics 25 (1992) 295-312. 47. Leydesdorff, Loet, ‘Structure’/’Action’ Contingencies and the Model of Parallel Processing, Journal for the Theory of Social Behaviour 23 (1993) 47-77. 48. Leydesdorff, Loet, The Challenge of Scientometrics: The development, measurement and self-organization of scientific communications DSWO Press, Leiden University, Leiden, 1995. 49. Leydesdorff, Loet, The New Communication Regime of University-Industry-Government Relations, In: Henry Etzkowitz and Loet Leydesdorff (eds. ), Universities and the Global Knowledge Economy: A Triple Helix of University-Industry-Government Relations. Cassell Academic, London, 1997, pp. 106-117. 50. Leydesdorff, Loet, John Irvine, and Anthony F. Van Raan (Eds. ), The Relations Between Qualitative Theory and Scientometric Methods in STS, Scientometrics (Theme Issue), 15 (1989) 333-631. 51. Leydesdorff, Loet and Olga Amsterdamska, Dimensions of Citation Analysis, Science, Technology and Human Values 15 (1990) 305-35. 52. Leydesdorff, Loet and Paul Wouters, Quantitative Measuring and Qualitative Understanding: Is it possible to bridge the divide in STS?, EASST Review 15 (1996, Nr. 3) 20-24. 53. Leydesdorff, Loet and Peter Van den Besselaar, Scientometrics and Communication Theory: Towards Theoretically Informed Indicators, Scientometrics 38 (1997) 155-74. 54. Luhmann, Niklas, Die Wissenschaft der Gesellschaft. Suhrkamp, Frankfurt a.M., 1990. 55. Luukkonen, Terttu, Citations in the rhetorical, reward, and communication systems of science. Ph.D. Thesis, University of Tampere, Tampere, 1990. 56. Luukkonen, Terttu, Why has Latour’s theory of citation been ignored by the bibliometric community? Scientometrics 38 (1997) 27-37. 57. MacRoberts, M. H. and MacRoberts, B. R., Another test of the normative theory of citing, Journal of the American Society for Information Science 16 (1987) 151-72. 58. Martin, Ben and John Irvine, Assessing Basic Research: Some Partial Indicators of Scientific Progress in Radio Astronomy, Research Policy 12 (1983) 61-90. 59. Maturana, H. R., and F. Varela, Autopoiesis and Cognition: The Realization of the Living, Reidel, Boston, 1980. 60. Meadows, A. J., Communication in Science. Butterworths, London, 1974. 61. Merton, Robert K., Priorities in Scientific Discovery, American Sociological Review 22 (1957, 6), 635-59. 62. Merton, Robert K., On the Shoulders of Giants: A Shandean Postscript. The Free Press, New York, 1965. 63. Merton, Robert K., The Matthew Effect in Science, Science 159 (5 January 1968, No. 3810) 56-63. 64. Moed, Henk F., W.J.M. Burger, J.G. Frankfort, and Anthony F. J. Van Raan, The Use of Bibliometric Data for the Measurement of University Research Performance, Research Policy 14 (1985) 131-46. 65. Moravcsik, M. J. and P. Murugesan, Some Results on the Function and Quality of Citations. Social Studies of Science 5 (1975) 86-92. 66. Mulkay, M., J. Potter, and S. Yearley, Why an Analysis of Scientific Discourse is Needed. In: K. D. Knorr-Cetina and M. Mulkay (Eds. ), Science Observed, Sage, London, 1983, pp 171-203. 67. Nadel, Ernest, Commitment and Co-citation: An Indicator of Incommensurability in Patterns of Formal Communicaiton, Social Studies of Science 13 (1983) 255-82. 69. Price, Derek de Solla, Science Since Babylon. Yale University Press, New Haven, 1961. 70. Price, Derek de Solla, Networks of Scientific Papers, Science 149 (1965) 510-15. 71. Price, Derek de Solla, Little Science, Big Science. Columbia University Press, New York, 1965. 72. Price, Derek de Solla, Citation measures of hard science, soft science, technology, and nonscience. In: C. E. Nelson and D. K. Pollack (Eds. ), Communication among Scientists and Engineers. Heath, Lexington, MA, 1970, pp. 3-22. 73. Rip, Arie and Marjan Hennekam, Acknowledging Funding in Biotechnology and Bioengineering, Science Dynamics, Report to the US National Science Foundation, Amsterdam, 1985. 74. Rumelhart, D. E., J. L. McClelland, and the PDP Research Group, Parallel Distributed Processing. MIT Press, Cambridge, MA/ London, 1986. 75. Small, Henry, Co-Citation in the Scientific Literature: a New Measure of the Relationship between Two Documents, Journal of the American Society for Information Science 24 (1973) 265-69. 76. Small, Henry G. Characteristics of Frequently Cited Papers in Chemistry. Final Report on NSF Contract #C795, ISI, Philadelphia (1974). 77. Small, Henry, Cited documents as concept symbols, Social Studies of Science 7 (1978) 113-22. 78. Small, Henry, Recapturing Physics in the 1920s Through Citation Analysis, Czechoslovak Journal of Physics 36 (1986) 142-47. 79. Small, Henry and Belver Griffith The Structure of the Scientific Literature I, Science Studies 4 (1974) 17-40. 80. Snyder, Herbert, Blaise Cronin, and Elisabeth Davenport, What’s the use of citation? Citation analysis as a literature topic in selected disciplines of the social sciences, Journal of Information Science 21 (1995) 75-85. 81. Spiegel-Rösing, Ina, Wissenschaftsentwicklung und Wissenschaftssteuerung. Suhrkamp, Frankfurt a.M., 1973. 82. Spiegel-Rösing, Ina and Derek de Solla Price, Science, Technology and Society: A Cross-Disciplinary Perspective. Sage, London/Beverly Hills, 1977. 83. Stichweh, Rudolf, Zur Entstehung des modernen Systems wissenschaftlicher Disziplinen. Physik in Deutschland, 1740-1890. Suhrkamp, Frankfurt a.M, 1984. 84. Stichweh, Rudolf, Self-Organization and Autopoiesis in the Development of Modern Science. In: Wolfgang Krohn, Günter Küppers, and Helga Nowotny (Eds. ), Selforganization: Portrait of a scientific revolution. Kluwer, Dordrecht, etc., 1990, pp. 195-207. 85. Van Raan, Anthony F. J. (Ed. ), Handbook of Quantitative Studies of Science and Technology. Amsterdam: Elsevier, 1988. 86. Weber, Max. Wirtschaft und Gesellschaft. Mohr, Tübingen, 1922. 87. Weinberg, Bella H., The Earliest Hebrew Citation Indexes, Journal of the American Society for Information Science 48 (1997) 318-30. 88. White, Hywel D., Daniel Sullivan, and Edward J. Barboni, The Interdependence of Theory and Experiment in Revolutionary Science: The Case of Parity Violation, Social Studies of Science 9 (1979) 303-27. 89. White, Howard D. and Belver C. Griffith, Author co-citation: a literature measure of intellectual structure, Journal of the American Society for Information Science 12 (1981) 163-71. 90. Whitley, Richard D., The Intellectual and Social Organization of the Sciences. Clarendon Press, Oxford, 1984. 91. Woolgar, Steve, Beyond the citation debate: towards a sociology of measurement technologies and their use in science policies, Science and Public Policy 18 (1991) 319-26. 92. Wouters, Paul, Citation Cycles and Peer Review Cycles, Scientometrics 38 (1997) 39-55. 93. Wouters, Paul The Citation Culture. Ph.D. Thesis, University of Amsterdam, Amsterdam (1998, forthcoming). 94. Wouters, Paul and Loet Leydesdorff, Has Price’s Dream Come True: Is Scientometrics a Hard Science? Scientometrics 31 (1994) 193-222. 95. Zuckerman, Harriet, Citation Analysis and the Complex Problem of Intellectual Influence, Scientometrics 12 (1987) 329-338. 96. Zuckerman, Harriet and Robert K. Merton, Patterns of Evaluation in Science: Institutionalization, Structure and Functions of the Referee System, Minerva 9 (1971) 66-100.